Loved everything about Unit B-11 on Sapphire Beach! We booked our stay through VRBO,and through there, met the most amazing owners Steve and Honey! The condo was spacious, very clean ,bright and airy with a wonderful beach feel to it. The owners made sure that we were well equipped with everything we could possibly need for our stay including a bottle of wine sitting on the table awaiting our arrival! Once we unpacked ,we walked out to the most beautiful beach I have ever seen. The sand was a nice soft white and the views were incredible! Every morning there was a beach lady cleaning the beach and also handing out and setting up chairs for the visitors. ( If there was anyone as pleasant as this lady I have never met them!). 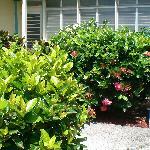 The grounds walking to the beach were so beautiful and lush with mature flowering shrubs everywhere. 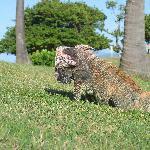 I looked forward to seeing the Iguanas basking in the sun on my way to the beach everyday. 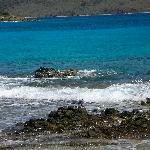 The trade winds made for a perfect day of relaxing on the beach and the crystal clear waters were warm and inviting. On the beach was a bar which served the most wonderful Bushwackers and also served food. there was also a convenience store on the beach. Although we found the prices in the supermarkets to be quite high,we found that the restaurants were quite reasonable and had quality and very tasty food. The ride into Red Hook or to Charlotte Amalie were very scenic and interesting as it was not unusual to see goats grazing on the roadside. I would recommend this condo to anyone who wanted to deal with the most sincere and honest owners and stay on one of the most beautiful beaches! I have been visiting these late-1960s-built condo apartments for over 30 years. My parents owned one of these units (C-19) for three decades until they sold it last year. They just rented a different unit for six weeks (B-11) and I stayed there for a week. There are several facts about these units you should know before deciding whether or not you will enjoy staying in them. The units in the four buildings (A-D), all within 50 yards of a small sandy beach shaded by seagrape trees, are condos owned by someone else. Some owners live there year-round or during the winter; some rent them out privately or through Alice in the condo office (or some other agent). 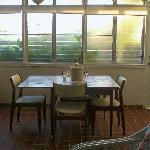 They are shotgun style apartments, with the living room in the “front” facing the beach, a galley kitchen, a bathroom, closets, another bathroom, and a “master bedroom” in the “back”. Condos rented as “studios” have the rear bathroom and bedroom closed off, and the renter has access to the living area (with Murphy-style pull-down beds), kitchen, bathroom, and some closets. This is usually cheaper than renting the whole unit. Many of the owners are somewhat older persons, which means you get less late-night partying and noise. 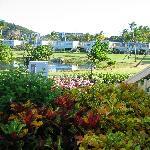 You will meet some owner-residents, and quite a few renters, depending on what season you go there. 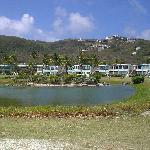 The beach is small, and a condo/hotel adjoins the property, sharing the eastern end of the beach. The beach is small but extremely pleasant, sometimes quite windy, the water is lovely, and there is a small reef 100 yards away with nice snorkeling. Sea Turtles, clown fish, living coral and other interesting marine life can be observed. Beach chairs are free to residents and renters, and they are the expensive comfortable ones. The water is sparkling turquoise and you have great views of St. Johns (a 15 minute ferry ride away) and Tortola in the distance. There is plenty of shade if you burn easily. Crystal Cove at Sapphire Beach has always been a place for me to completely unwind. 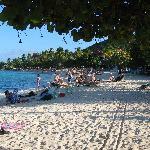 The main activities are eating, sleeping, lounging on the beach, and chatting with other tenants. There is a salt-water swimming pool and tennis courts on the complex. There is a nice tiki bar next door, and a restaurant, which had fallen on some economic troubles, appears to be about to re-open. There used to be a fantastic boutique, which closed; now there is a crummy and expensive snack shop (avoid it). There is a small supermarket and a couple of restaurants in Red Hook, a 2 minute drive. There are larger and cheaper supermarkets 10-15 minutes drive. You will want to cook most of your own meals. Many units have Weber grills available. Understand that these condos units are all the same construction, but many have been updated, reburbished, or enhanced. My parents did very little to their over 30 years- it still had the original red tiled floor, tiny kitchen, etc. They did cut away the wall between the kitchen and living room, as did almost all the owners. However many of the condos have been made much more beautiful and comfortable, with white stone tile floors, expanded kitchen space and counters, leveling and extending the patio or balcony into the unit to create a larger living space. Ask for photos before renting. This is not a fancy, “modern” place. This is a spot to immerse yourself in relaxation. Your biggest worry should be what type of sandwich to have for lunch, and when to start your cocktail hour. 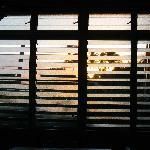 Some people run their air-conditioning all the time, missing the point of being in the tropics in the winter. It’s in the 80s during the day and around 70 at night, and the breeze is nearly constant. Why have A/C when you can breathe soothing salt-sea air and hang out in a bathing suit 24 hours a day? If you are looking for lots of activities, this is not the place. If you want all the modern conveniences of home, this ain’t it. If you can’t shift from Type A to Total Relaxation, you might not enjoy this place. It’s a “mañana” culture, and you have to go with the flow. Depending on which condo unit you rent, your surroundings may be very dated but comfortable, or modern and stylish. The main focus is the chance to wake up 50 yards (more or less) from the beach, go to sleep with the sound of the surf in your ears, and wander around in a bathing suit all the time in mid-winter. It’s also pretty darn nice any time you go (fewer tourists in the off and shoulder seasons). So think about it, investigate, talk to some owners, get photos, and go. You will probably never regret it, and the price is quite reasonable, considering the nature of the surroundings. Many people, my parents included, rented for two weeks, and then bought and stayed for several decades. We are dismayed that the writer rated our unit only 3/5 for cleanliness. Prior to his parent’ arrival, the unit was cleaned under the supervision of a condo staff member (Norma) recommended to us by his parents, who also supervised the cleaning after their departure. As best we can reconstruct, the writer arrived at least two weeks after the arrival of his parents. If his parents did not maintain the standard of cleanliness that he would have preferred, this should not reflect adversely on Unit B-11! As for 3/5 for “rooms” and” Older Style”, the picture he posted speaks for itself. Yes there are nicer units at Crystal Cove, and you will probably pay two to four times as much for them! The first is extremely minor. If return for the free use of this calendar, I agreed to allow the placement of a very small advert. It is for travel insurance. I know absolutely nothing about the company being advertised. The second is far more serious, and really idiotic. For some reason a single column is used for both Saturday and Sunday. A consequence is that the dates shown rarely appear under the correct day of the week above. So you will have to use this calendar in conjunction with a “normal” calendar to determine what day of the week any given date falls on! Posted on 2017-04-13 2017-07-18 Leave a comment on When Can I Come? But, under no circumstances make your reservation on this site. They will charge you a hefty “Booking Fee” for which you will derive no benefit!